Port-of-Spain, Trinidad, December 5, 2017: “Every little girl with a dream of playing sports, must understand that the dream is always within her reach- regardless of her creed, race, or background. 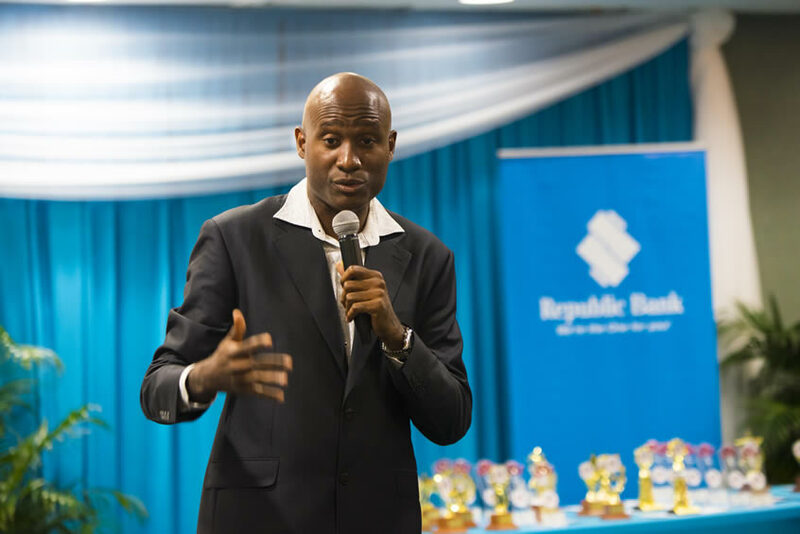 Every young woman must understand that hard work pays off, and with every success achieved, comes the responsibility to do more, to encourage as many as possible, to follow that very same path.” Those were the words of encouragement shared by the Bank’s Manager’s Assistant, Christopher Aird, as he spoke at the closing and prize-giving ceremony of the 2017 Republic Bank Laventille Netball League. The ceremony was held at Republic House, Park Street, Port of Spain, last Saturday. The League, which has been a mainstay on the Bank calendar for over 30 years, is part of the Bank’s ongoing commitment to youth empowerment through sport, through the Bank’s Power to Make a Difference Programme. Over the years the Bank, came to recognize the importance of the League, in the lives of the young people within the Laventille community and environs. Also sharing words of encouragement with the young participants, was Don La Foucade, Motivational Speaker, In Full Flight. La Foucade, a product of the Laventille community, used the acronym, “Netball” to motivate the young people. “No Excuses To Be All that you can be,” he stressed, adding that if others can achieve so can they. La Foucade, said he hoped to see more young people representing this country aboard on the national team. Also present at the event, were Austrid Rochford President, Laventille Netball League, Lily Stapleton, Secretary of the League, coaches and team captains. Sarah Charles of the St. Judes Girls Home provided entertainment. 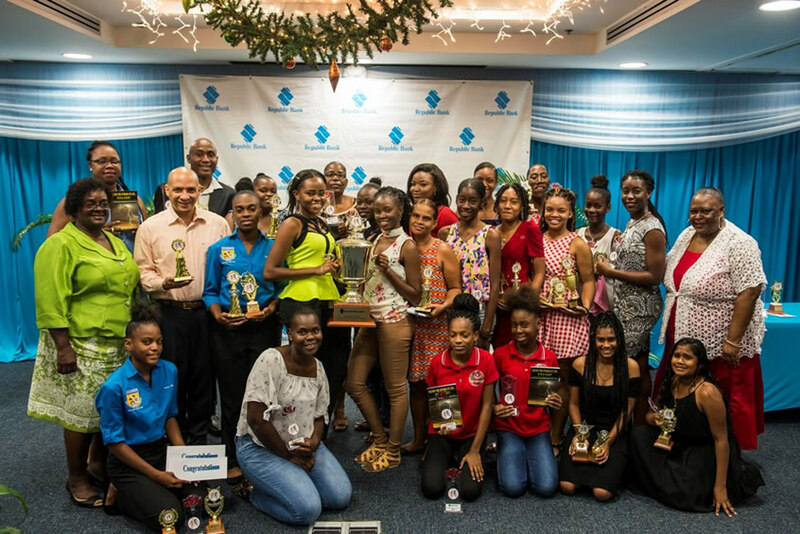 Players who excelled in categories such as; MVP (A Division), MVP (Inter-Division), MVPs (B Division), MVPs (Beginners Divisions) Top Shooters, March Past and March Past Queen, were awarded trophies. Republic Bank congratulates all the participants of the League and takes great pride in partnering with the Laventille Netball League to offer to our nation’s youth avenues to help make a positive difference in their lives, their families and their communities. Achievers: Winners of the 2017 edition of the Republic Bank Laventille Netball League pose for a photo, along with Christopher Aird, Manager’s Assistant, Group Marketing and Communciations (second on right) Don La Foucade, Motivational Speaker and members of the Laventille Netball League, at the prize-giving ceremony, held at the Bank’s Head Office, last Saturday. Be the best that you can be: Motivational Speaker, Don La Foucade, Managing Director of In Full Flight, delivers a thought-provoking message at the ceremony.